If your startup is in need of external funds, you might want to consider applying for one of the equity-free government schemes financed by the Innovation and Technology Fund (ITF). One scheme that became increasingly popular for startups over the last couple of years is the Enterprise Support Scheme (ESS). By staying diligent, and with a little bit of patience, companies can get large amounts of funding on a 50% matching basis. This means that for every dollar provided by ITF, the receiving company has to provide one dollar. 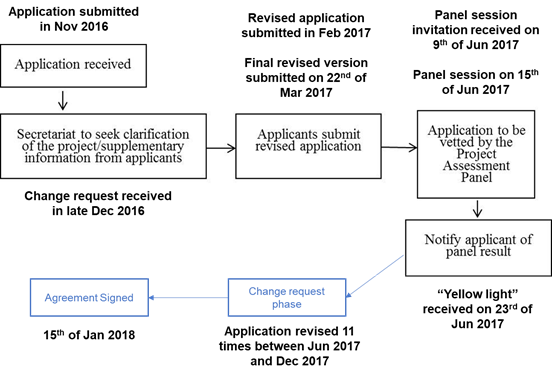 This article is a description of the ESS application process with details about what to expect after signing the funding agreement. The content is based on my personal experience of securing the ESS funding for my startup in January 2018. I hope it will give some clarity on this process that is not well documented and can quickly become frustrating. 4.1 When does it make sense for me to apply? 4.4 What happens if you need to terminate the project early? The download link provides a PowerPoint version of the application guide and a document checklist template. ITF was created in 2000 and is administered by the Innovation and Technology Commission (ITC). The goal of the fund is to encourage local companies to conduct R&D projects to increase the added value, productivity and competitiveness of Hong Kong’s economic activities. It was originally meant to provide large financial support to established corporations but recently extended its scope to consider startups and SMEs that are in need of smaller funds. Currently, ITF provides 12 different funding schemes. ESS is one of them. On the 28th of February 2018, the government designated HKD 50 billion (USD 6.4 billion) to the Innovation/Tech Sector in its 2018-2019 annual budget. This initiative was approved by Carrie Lam to support the vision of Hong Kong becoming an innovation hub in Asia. Besides, we will inject $10 billion into the Innovation and Technology Fund (ITF). The ITF’s financial support for I&T development in Hong Kong has increased from about $700 million in 2013-14 to $1.5 billion in 2017-18. It is anticipated that the demand for funds will continue to increase. As our fiscal position is strong this year, I believe that a funding injection is opportune. The ITF will continue to support applied R&D work in Hong Kong with the additional resources. Indeed, it is a good time to apply for government funding! When does it make sense for me to apply? You have a colleague, intern or admin who can help you prepare the application form and supporting documents as well as follow up with your case manager. These are very time-consuming tasks and as a founder your focus should be to run the business, not file forms. You have sufficient budget to match the funding without jeopardizing your cash flow. If you are considering taking a bridge loan, then make sure to plan ahead of time. Although not mandatory, your chances to have your application approved increase significantly if your startup is part of a recognized incubator/accelerator such as HKSTP or Cyberport. In our case, the entire process from the moment of submitting the initial application to signing the funding agreement took 1 year and 2 months. 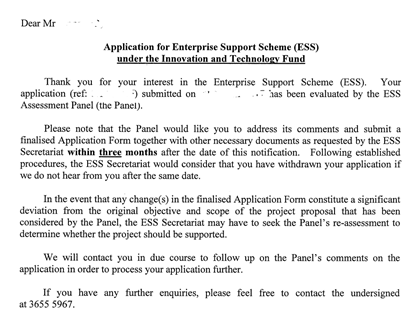 This felt terribly long and was mainly due to the ESS being a newly introduced fund at the moment of the application and the lack of clarity/transparency about the process. If you apply today, and with the insights from this article, you should be able to sign the agreement within 6 months. Keeping your documents structured will help the ITC case manager to more easily process your application, shortening the overall application timeline. The document checklist is part of the download package. The latest guide for filling out the application form is provided by ITC on the official website. These are only general guidelines that don’t really help you understand what ITC expects to see. Make sure the project idea, implementation plan and value for Hong Kong is described clearly and in non-technical words. Mention that you plan to apply for a patent. Mention that your company will create local jobs post-project. Every current salary claim will have to be backed by payroll slips. Don’t inflate the numbers! Salary for company shareholders can potentially be approved by the Assessment Panel, however ITC will divide the approved amount in 2. You can add new positions as “to be hired” on the application. 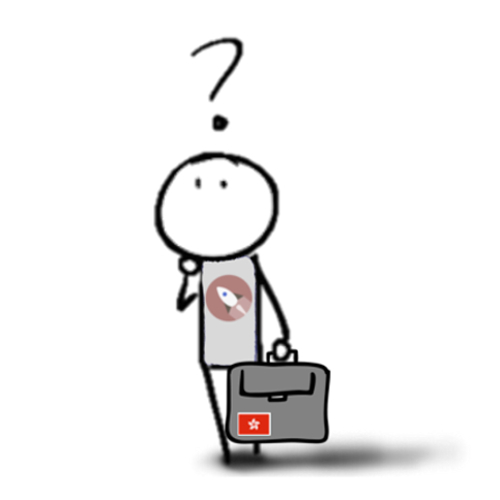 It is hard to define R&D milestones several semesters in advance, especially as a startup. But because ITC requires you to do so, try to be as generic as possible to allow future pivots. Rule of thumb for Part E Benefit-Sharing: check off “yes” only if the requested amount from ITF is larger than HKD 2.8M. Project Coordinator and Deputy Project Coordinator are required to be employed by the company during the entire application and project period. These can be part-time employments without remuneration. Don’t be the bottleneck! Once ITC returns the application to you in the system with their comments, make sure to submit a revised version as soon as possible. The presentation is the scariest part of the process. You will be invited to speak in front of an assessment panel of 10 to 20 people as diverse as university professors, industry experts and senior government employees. They will challenge you by asking detailed questions about your business, the technical aspects of your project and the quality of your team. The presentation will be held at the Wan Chai Immigration tower and the format is a 5-minute presentation followed by 25 minutes of Q&A. Don’t use your slides for the presentation. Simply make sure you clearly explain the problem you are trying to solve, the innovative technology you are using and the quality of your team. Use your slides for strengthening your answers during the Q&A part. Make sure to emphasize why you really need the money. After the presentation, ITC will notify you within 2 weeks about the result. ITC never gives the “green light” right away and will always request adjustments. As a matter of fact, from the 63 successful applications before us (as of January 15, 2018), not a single company got the “green light” directly. These are very frustrating months as ITC will ask you to revise the application multiple times to make it more comprehensive to them. My recommendations are about the implementation plan (the deliverables for each milestone) and the budget (manpower) sections of the application, as well as the project bank account. For the milestones in the implementation plan, create easy-to-understand bullet points with deliverables that can be measured in a quantitative or qualitative way. Module 1: scan any file in XML and XLSX format located in a defined folder. Module 2: automatically convert the files into PDF format. The size of the files can be up to 1 GB with maximum 100 columns and 10 million rows. The supported file types will be sales orders. It doesn’t have to be technically difficult, just make it easy for ITC to assess whether you completed the deliverable or not. Make the academic and professional qualifications of each manpower position as easy to recruit as possible. As an example, don’t write “university degree in Computer Science and 3 years of working experience” if you can simply write “university degree”. In the event that one of your team members leaves, you will have to fill the position, and it is unnecessary to constrain yourself by being too precise. Don’t forget to register a separate risk-free interest-bearing savings account in a Hong Kong bank. This account will be used by ITC for funding distribution/monitoring purposes. This can take 3 months, so do it right after receiving the “yellow light” and show the letter to the bank. In the ESS application form, make sure to check off “yes, your company will consider applying for the R&D Cash Rebate Scheme if the Project is approved by ESS”. If approved, the reimbursed amount will effectively be 70% of all expenditures (instead of 50% under normal ESS). You can submit your application when 50% of the project expenditure have incurred. The cash flow part is one of the downsides of all ITF schemes. You will always be required to pay first and receive the funding later. * ITC reserves the right to pay 10% of its funding after successful completion of the project. The highlighted months include the milestone assessment meetings. For the milestone meetings, your ITC case manager will come with his/her supervisor to your office and you will be required to do a demonstration with your team. These are not technical people and their only task is to make sure you deliver what you promised; therefore, it is best to put your deliverables in a bullet list that check off sequentially. To mark the milestone as completed, you will also be asked to instruct an accounting firm to release an external audit report. This report is only about the transactions done from the ESS bank account. 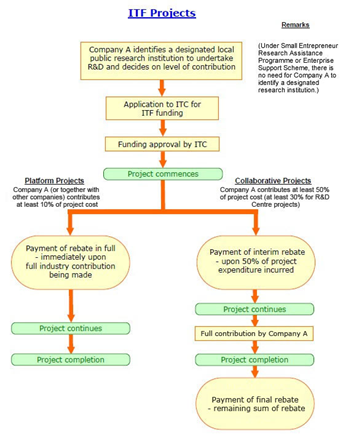 The application documents are out of scope as they were already validated by ITC before signing the funding agreement. What happens if you need to terminate the project early? There are many things that can go wrong with a startup, and you may have to terminate the project for reasons other than the project itself (e.g. financial difficulties force you to dissolve the company). ITC knows there is a high risk associated with investing in startups and an early project termination is possible. The easiest case is to simply return all the funding received by ESS. If these are not fully available (i.e. already used for making salary or equipment payments), then ITC will conduct an ad hoc assessment meeting to try to shorten the project period and recognize the expenditure incurred until termination date. 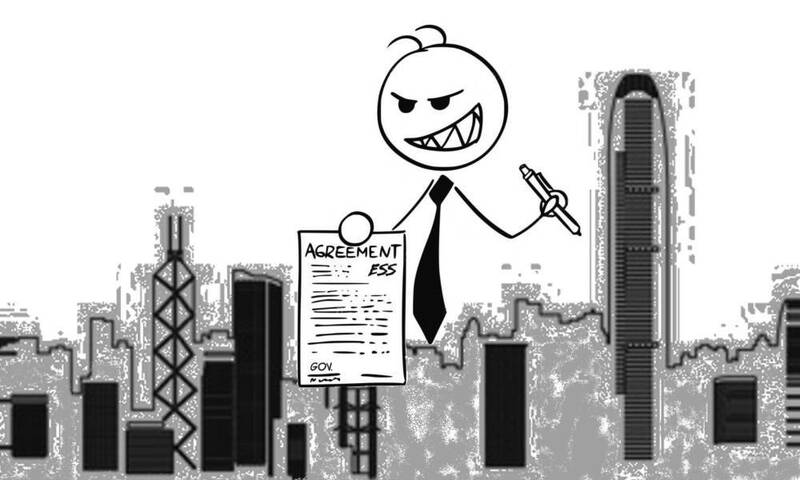 The ESS agreement is done between ITF and your company, so you will not be personally liable for the funding disbursed. However, if you mismanage the funds then it becomes a legal issue and ITC will submit a Court order against the directors. But don’t overthink; as long as you are handling the project properly you will be fine. The ESS is a fund that has started getting popular for startups. With the good news about the annual budget 2018-2019, it is a good moment to consider applying to finance your R&D projects. The application process is tedious and can be frustrating. I hope this article will help you avoid wasting time. If you already started the application and have more specific questions about ESS, send me a direct email and I will try to give you additional details.